I am so grateful to all those who come and read my blog and enter our Giveaways and follow Daydream that I have decided to post this great little pattern I designed for this cute chef set. This is an quick and easy sew, but with impressive results. Perfect for all those cute scraps you've been saving. This would also be such a cute project in an easter print to tuck into someone's easter basket. So get creative and let's get sewing. I just found you on Pinterest, and I am so glad I did! My daughter and I are going to do this for her American Girl dolls next month :) Thank you SO much for sharing!! Thanks so much for the pattern! I'm always looking for free patterns! Thank you!! I am so excited to sew this for my little girl! Thank-you for all your comments. I would love to see some aprons you sew up and post them on the blog. Send pictures to daydreamdollboutique@gmail.com. thanks everyone. Aaaaaaammmmmaaaaazzzziiinnnnnnggg!!!!!! I LOVE IT!!! I'm printing my pattern and will work on this tonight! I tried to click into print this free pattern (Doll Chef Pattern) that my grand daughter likes, but it comes up with an unrelated ad. Email grsilvan@earthlink.net or face book Glenna Silvan. I am a veteran seamstress and quilt designer. I could figure this out and do my own flat pattern, but really would appreciate a pattern. Thanks! I tried to open this pattern after I saved it to my files and it would not open. So fun! Thanks for the free pattern! Super pattern! So easy to make! I made 2 sets in one evening! Thank you so much! Do you have any other 18" doll patterns? Hi, I tried to download and it absolutely would not let me. Would you be willing to email it to me at cjtatman@msn.com? I'm making my granddaughter a chef outfit and would love to make this for her doll. 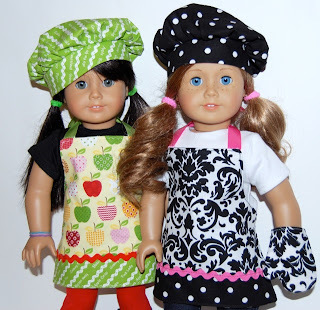 Today my daughter asked if we could make Holly (her AG doll that she got for Christmas) an apron and chef's hat. Simple search and voila! Here we are! Not only did we find a free pattern but a wonderful new blog to visit! Thanks! The problems must be fixed--downloaded and printed the pattern for me just fine. We're working on it now! This pattern looks great; thank you! Just FYI - your "Pin it" link at the bottom of your post doesn't seem to work. Thank you for the pattern, my daughter and I are so excited to make this today! I ran into trouble printing out the pattern pieces. The 1" block is correct but the sewing pattern pieces printed out huge and I couldn't see the ends of the apron pattern when I removed the "fit to page" on the printer. Should I reprint it and print to "fit to page" to get the correct size? Maybe if you emailed it to me that would help? Thank you so much for this! Email me at daydreamdollboutique@gmail.com and I can send it over to you directly to see if that helps. Love this free pattern! Thank you so much! I've made 2, and have 2 more cut. My granddaughters, and nieces will love them! I am sooooo happy to have found your site. I have two great nieces who are going to be ecstatic thanks to you and your patterns, talents, and sharing. Thank you so much. Thank you so much for this free pattern! My daughter just made this as her first real sewing project and it came out so beautifully, she is thrilled! So awesome. Someone shared this link to our 18" doll sewing group. Thank you for the beautiful patterns. This link doesn't work and says "Account Suspended" I hate that because this is so cute. Just tried the link today... says "Server not found". Sad as this was rather cute and it's hard for meto afford good AG style clothing. I am so sad as my daughter fell in love with this pattern!!! I wish there was a way to get it!! Would anyone be willing to share the pattern--it doesn't seem to be available. My email is alycemrossi@gmail.com. I found you on Pinterest and love the pattern. I made it as a gift for a little girl and her American doll. Easy pattern but found that I had to enlarge the glove by 15% to fit the American dolls hand. I keep getting a page error when I try to get the chef's apron pattern. Could you email it to me please. Tastemonials@jhmartin.org. Thank you. Okay now. I found it here. No luck opening this, and I have nine granddaughters in the wings...I hate to be a pest, but could you email it to me? I cannot access this pattern despite several attemps.. I get nerror404, can i have it on my mail, please? My computer shows no pattern for the Chef Set. Could you please send it to me? Thank-you to Our Party Hostesses ! Spring for Spring Sale Today ! Doll furniture is here ! Our January Giveaway Winner !